This issue has a great editorial introduction which discusses the then-current controversies involving FARMS and Signature Books, a fascinating chapter in Mormon apologetics and even just Mormon studies more broadly. After this introduction, however, the issue starts slowly, and never really fully picks up steam. Of the first 12 reviews, only one engages a volume critical of Mormons, and even that review is relatively short. There are also a couple more interesting reviews of faithful books, but nothing particularly noteworthy. Of the remaining 18 reviews, only 6 of them engage critical material, and most of it is standard sectarian anti-Mormonism, which only 4 volumes in is already getting boring. (I can only imagine what it was like for those who had to keep reviewing these books.) I nonetheless recommend these reviews because they tend to have potentially useful material on the Book of Mormon, and for the sake of some who may not have already gotten over the standard hurdles of 1990s anti-Mormonism who might find these reviews helpful. Of interest is the reviews of Charles Larson’s By His Own Hand Upon Papyrus. While most of sectarian anti-Mormonism was getting stale, the Book of Abraham debates were just beginning to get interesting. John Gee and Michael Rhodes both review it here and provide some very interesting information. Altogether, counting the introduction, there are 8 pieces in this issue which deal seriously with critical claims, out of 31 total, which is about 26% of the reviews. The rest isn’t complete fluff, but is for the most part uninteresting and irrelevant today, with a few minor exceptions. A couple reviews had an interesting insight once or twice, but were not consistently engaging. Daniel C. Peterson, “Editor’s Introduction – Questions to Legal Answers,” pg. vii-lxxvi: Some of the critical reviews in the previous issue generated some controversy, including that threat of legal actions from Signature Books. Peterson reflects on that controversy, exploring several questions of a legal, ethical, and even religious nature. In the process, he responds to many allegations made against him and FARMS and tries to set the record straight on a number of matters. That such a big deal was made over a few critical reviews is, frankly, embarrassing (for Signature Books and its supporters), but Peterson’s analysis and response to the situation is as enjoyable as it is thorough. A must read for anyone interested not just in Mormon scholarship, but the history of that scholarship and its conflicts. This was only the beginning of what became a sort of rivalry between FARMS and Signature Books. Louis Midgley, “George Dempster Smith, Jr., on the Book of Mormon,” review Robert Basil, Mary Gehrman, and Tim Madigna, eds., On the Barricades: Religion and Free Inquiry in Conflict (Buffalo, NY: Prometheus Books, 1989), pg. 5-12: The usually long-winded (or many-paged, if you will) Midgley offers some short comments on George D. Smith’s contribution to the anthology On the Barricades. Smith is the owner of Signature Books. As usual, Midgley has more to say in terms of background on the people and ideas than on the article itself. Still, interesting reading, to be sure. Midgley talks about the ideological background of Free Inquiry and secular humanism, notes Smith’s connections to both, and comments on how that background informs Smith’s perspective on the Book of Mormon and its place in the Church. Donald W. Perry, “Review of The Book of Isaiah: A New Translation with Interpretive keys from the Book of Mormon, by Avraham Gileadi,” pg. 52-62: Perry is highly critical of Gileadi’s new translation, concluding (essentially) that the KJV of Isaiah is actually better. Gileadi’s book and translation are not especially significant today, but Perry offers some valuable comments on Isaiah and Isaiah in the Book of Mormon that I don’t want to forget about. While I don’t necessarily agree with Perry, given his level of expertise I would recommend those interested in the Isaiah question as it relates to the Book of Mormon be familiar with his opinions on the subject, which are expressed in this review. Matthew Roper, “Review of The Truth about Mormonism, by Weldon Langfield,” pg. 78-92: Langfield provides the litany of typical anti-Mormon arguments, and Roper provides apt responses to many of them. Roper responds to claims regarding Joseph Smith’s character, early Christian teachings, the Spaulding theory of the Book of Mormon, the notions of proof and evidence, and anachronisms in the Book of Mormon. John Gee, “A Tragedy of Errors” (plus an “Addendum” by John L. Sorenson), a review of Charles M. Larson, …By His Own Hand Upon Papyrus: A New Look at the Joseph Smith Papyri (Grand Rapids, MI: Institute for Religious Research, 1992), 93-119: Larson’s book remains the go to source on the Book of Abraham among many anti-Mormons. His argument, hinging on the Kirtland Egyptian Papers as “translation documents”, is ultimately at the heart of every attempt at discrediting the authenticity of the Book of Abraham. So, John Gee’s devastating review – demonstrating that the book is seriously flawed both in fact and logic – remains important reading on the Book of Abraham. Gee points out the deceptive packaging and marketing of the book, noting that much of the deception seems deliberate. Gee then gets into the numerous historical and Egyptological inaccuracies, followed by a response to some of Larson’s attempted refutations of LDS arguments, showing that Larson spends more time knocking down straw men than anything else. This leads into some discussion of the evidence for a missing scroll(s) that Joseph Smith had, and then to the Kirtland Egyptian Papers. This makes for some very good stuff, though some of it should be supplemented with more recent reading – especially the part on the KEP, which have remained enigmatic, though important progress has been made on them in recent years. Gee closes by pointing out a number of evidences that come from studying the text of the Book of Abraham, which are avoided by Larson and often are avoided by critics still today. The end of the paper has an “Addendum” by John L. Sorenson providing clarification on Thomas Stuart Ferguson and the New World Archaeological Foundation, since Larson tries to hold Ferguson up as a poster child. Sorenson points out that Ferguson was an amateur, and betrayed a naïve understanding of archaeology and “proof.” Sorenson also provides numerous factual corrections. Michael D. Rhodes, “The Book of Abraham: Divinely Inspired Scripture,” a review of Charles M. Larson, …By His Own Hand Upon Papyrus: A New Look at the Joseph Smith Papyri (Grand Rapids, MI: Institute for Religious Research, 1992), 120-126: Rhodes offers another, shorter review of Larson’s book, making some of the same points. Rhodes review remains valuable in study of the Book of Abraham as it highlights some interesting evidence, especially relative to Facsimilie 2, figures 1, 3, 4, and 6. 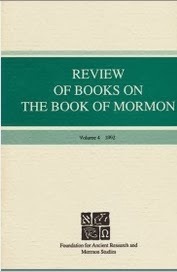 Matthew Roper, “Review of Mormonism: Shadow or Reality? By Jerald and Sandra Tanner,” pg.169-215: Roper tackles the Tanners once again (he previously reviewed their Covering up the Black Hole). The Tanners arguments against the Book of Mormon are pretty standard and representative, so Roper’s response here is a rather handy source for Book of Mormon apologetics. He addresses arguments related to the Book of Mormon witnesses, noting the Tanners tendency to misquote Richard L. Anderson on the subject, alleged 19th century sources, the comparison of King Benjamin’s speech to a 19th century revival, infant baptism, paid ministry, anti-Masonic influences, Biblical influence, the name Mosiah, and more. Roper makes an interesting point regarding Josiah Priest, one of the supposed sources Joseph Smith could have used, and someone who held to the 10 tribes’ origin for Native Americans. Roper points out that Priest was actually aware of, and critical of, the Book of Mormon and didn’t seem to think it plagiarized his work. Thus, someone you would expect to be sympathetic toward the Book of Mormon, if it was representative of the 19th century cultural milieu, did not think it represented contemporary thinking at all. John A. Tvedtnes, “Review of The Use of the Old Testament in the Book of Mormon, by Wesley P. Walters,” pg. 220-234: Tvedtnes reviews and responds to Walters arguments about how well Joseph Smith knew the Bible, the alleged Bible borrowing of the Book of Mormon, some discussion of the Isaiah passages, and other similar criticisms. Tvedtnes most unique contribution here is his anecdote about John B. Krueger not taking his own study seriously and being impressed with the possibilities on Book of Mormon names that Tvedtnes had raised. Stephen D. Ricks, “Death Knell or Tinkling Cymbals?” a review of Wesley P. Walters, The Use of the Old Testament in the Book of Mormon (Salt Lake City, UT: Utah Lighthouse Ministry, 1990), pg. 235-250: In another review of Walters book, Ricks responds to arguments about style of translation (NT KJV style in the Book of Mormon), pointing out some of the complexities of translation (for example, Ricks notes that even the same phrase in an underlying text often is translated differently each time the translator encounters it). Ricks also responds to issues like New Testament material in the Old Testament era, the Melchizedek text in Alma, and the View of the Hebrews as a source for the Book of Mormon. 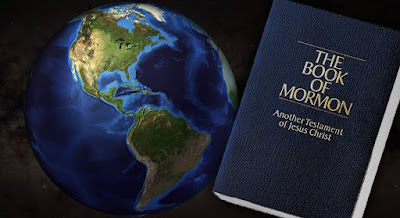 Here Ricks points out that, as I have pondered from time to time, it is significant that no one in Joseph Smith’s day and age – when the ideas of Ethan Smith and others were quite popular – drew or noticed any kind of connection between View of the Hebrews and the Book of Mormon. Why wasn’t it so obvious to them that this was the source? Could it be that what looks so similar to us now, from a distance, really looked nothing like each other up close to the people living when both books were published? At the time, the views of Ethan Smith and others who proffered similar theories were widely accepted, and yet the Book of Mormon, so seriously mocked and ridiculed, seemed to be something entirely different to the contemporary audience. If I had read this issue at a different time, rather than right after reading the 3 preceding issues, I might have felt differently about it. But as it stands, I was largely unimpressed with this issue. Still, there is enough useful information to make some of these reviews worth the time to read them. The must reads are Peterson’s introduction and Gee’s review of Larson. As I have said, if you are interested in a little bit of the back history of the FARMS-Signature animosity (that lives on today, despite the fact that one of the organizations technically no longer exists), then you must read Peterson’s fascinating intro to this volume, and Peterson is always entertaining to read. The Book of Abraham has, in the last 20 years, become the major focal point of attack for many critics, and many who struggle tend to struggle with it rather than the Book of Mormon. Many of those who leave over criticisms of the Church cite the Book of Abraham as a larger determining factor than issues with the Book of Mormon. As such, reading up on the scholarship on the Book of Abraham is increasingly important, and Gee’s review here remains an indispensible piece of that scholarship. Rhodes review is also important in this respect. The second review by Roper and the review by Ricks also contain some interesting information, particularly in relation to Josiah Priest and Ethan Smith, two advocates of the 10 tribes theory from Joseph Smith’s day. Ricks also makes some interesting remarks regarding translation. In the end, though this issue of the review was somewhat disappointing, it is also not a terrible issue either, and it makes a few important contributions to Mormon scholarship.